In my last posting I suggested that a module specification could usefully have four sections, clearly articulated, for Intended Learning Outcomes, so that a student could identify from their assessment evidence that they had met specific ILOs in a range of domains. In doing so they not only have a useful platform to identify future learning needs, but also the potential to negotiate the accreditation of prior accredited learning in a much more fine-grained and meaningful way, something I fully expect to become a significant future of international higher education accords in the next few years as institutions face up to the challenge of accredited OER schemes and credit bearing MOOCs. I believe the design of intended learning outcomes for modules and programmes will become a strategic priority. Not everyone agrees ILOs are effective and a useful critique from Hussey and Smith is well worth reading (Hussey & Smith, 2002). How many Intended Learning Outcomes (ILOs) one designs into a module or a programme level specification has to depend on the scope of the module or programme itself. I’m sure colleagues can adapt what I’m saying here to their own quality assurance and institutional contexts. For the purpose of this reflection let me take a single module, worth 15 credits. In the UK context this would frequently represent one-eighth of a stage of undergraduate degree study, there being three stages each representing 120 credits. 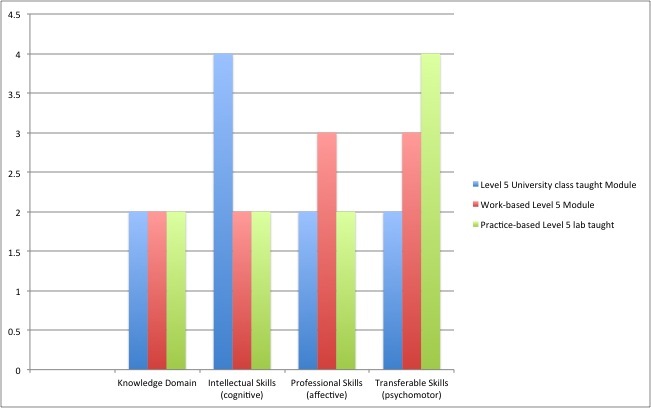 Again, in the UK context there is a strong notion of progression in higher order thinking skills between the first stage of undergraduate study (level 4) and the final stage (level 6). This progression is articulated in generic guidance that captures much of this ILO debate and in subject specific guidance drawing on the discipline communities to create ‘benchmarks’ for what be expected to be in any named award (www.qaa.ac.uk) . Level 5 would represent the second stage of undergraduate study in the UK context, the equivalent of an exit point for a Higher National Diploma or a Foundation Degree, the European Qualifications Framework Level 5 and within the EHEA (Bologna) sometimes referred to as a ‘Short Cycle’ award. My example then is for a 15-credit module at level 5. The UK quality assurance agency does not specify periods of study for credit, but sector norms talk in terms of notional study hours and it is perhaps helpful therefore to think of 15 credits as 150 notional study hours, 30 credits as 300 notional study hours and so on. The subject domain is often conflated with the cognitive domain, which is understandable as it is within Bloom’s ubiquitous taxonomy, but this does tend to confuse faculty as to the distinction between knowing and understanding a body of factual knowledge and being able to do something with that factual knowledge. The Subject domain can, and in my opinion should, be limited to defining the subject area for illustrative purposes for the student. Since the principle is that all Intended Learning Outcomes should be assessed and it is actually rather difficult to assess whether someone ‘understands’ something without having them ‘operationalize’ the knowledge, I tend not to get too hung up on the active verbs used in this domain, contenting myself it serves to contextualise what follows, but maybe I should and another post later will unpack Anderson and Krathwohl's Knowledge Dimension in more detail. This domain refers to ‘knowledge structures’ building from the base of the Subject domain, the “knowing the facts”, towards high order thinking skills in which these facts become operationalized and transferable. This domain is familiar to most faculty and synonymous with the work of Bloom from the 1950s (Bloom, 1984) and the useful revisions made in 2001 (Anderson & Krathwohl, 2001). The affective is concerned with an individual’s values, and includes their abilities with respect to self perception through to abstract empathetic reasoning. In an extension to the early work by Bloom progressive stages take the learner from foundational ‘receiving’, through to the ‘internalization’ of personal value systems (Krathwohl, Bloom, & Masia, 1999). In the context of Higher Education programmes, particularly an era when the employability of graduates is stressed, an awareness of these professional values would do well to be built into the relevant modules. The psychomotor domain is less well researched and documented and this has meant a less than adequate recognition and incorporation into learning designs. Frequently tactile or technical skills become seen as ‘general skills’ or ‘transferable skills’ and there is little sense of progression. This domain refers to progressively complex manual or physical skills and so could identify the progressively complex skills of a biologist in using microscopes, or an economist using a statistics software package (Dave, 1967). I find this domain unfortunately neglected as I believe it would enhance course designs if note were taken of the practical technical skills required within disciplines and their articulation in Intended Learning Outcomes. The actual balance between these domains in terms of how many Intended Learning Outcomes one might assign to them in the context of a 15 credit module will depend on the context of the module, its mode and its programme context. One might reasonably expect to see some differences in the balance of ILOs in modules in different contexts, illustrated below. In this example each module has ten Intended Learning Outcomes but the emphasis within the module will change. Whilst it may be appropriate to stress intellectual skills (analysis, synthesis, evaluation) in a classroom based political science course for example, on might expect to see transferable skills (often described as practical, tactile or technical skills) stressed in a technical lab based course, skills such as manipulation, articulation and naturalisation of technical proficiency. All too often Higher Education stresses the cognitive, over reliant perhaps on Bloom’s taxonomy and related work, and neglects the affective and psychomotor domains. This is has several consequences; it relegates anything that is not seen as ‘intellectual’ to a lower order of skills despite the fact that employers and students recognise and demand the need for broader skills (Mason, Williams, & Cranmer, 2006). In doing so it forces programme leaders into ‘bolt-on’ skills modules that demand additional institutional resource and student resource and frequently ill-serve the purpose. No learning design is truly student-centred if it is neglecting other domains of experience (Atkinson, 2011). The model advocated here separates the knowledge domain and the intellectual skills, focussing the module designer on the ‘skills’ that will be acquired independent of the subject knowledge acquired. This, along with a focus on the affective and psychomotor skills, provides a framework for a module that is balanced in terms of what the student does, the context in which they do it, and correctly assessed ensures all these intended learning outcomes can be justifiably claimed in the student’s transcript. Indeed it is not difficult to imagine a student coming to the end of the first stage of their degree, recognising that they have excelled in the psychomotor skills but struggled in the cognitive, and make module choices for future stages either to redress that balance or acknowledge their strengths and adjust choices to reflect future career path. So how do you write learning outcomes across these four domains? That’s the subject of the next posting. Atkinson, S. (2011). Embodied and Embedded Theory in Practice: The Student-Owned Learning-Engagement (SOLE) Model. The International Review of Research in Open and Distance Learning, 12(2), 1–18. Bloom, B. S. (1984). Taxonomy of Educational Objectives Book 1: Cognitive Domain (2nd ed.). Addison Wesley Publishing Company. Dave, R. (1967). Psychomotor domain. Presented at the International Conference of Educational Testing, Berlin. Hussey, T., & Smith, P. (2002). The Trouble with Learning Outcomes. Active Learning in Higher Education, 3(3), 220–233. Krathwohl, D. R., Bloom, B. S., & Masia, B. B. (1999). Taxonomy of Educational Objectives Book 2/Affective Domain (2nd ed.). Longman Pub Group.